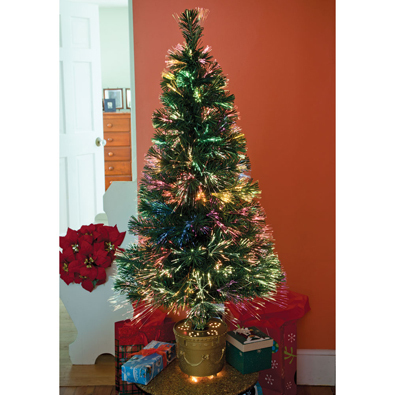 *Sorry, Gift Wrapping Not Available for Fiber Optic Christmas Tree. Plug in our Christmas trees and admire the ever-changing color. The full foliage branches are strong enough to hold your own ornaments and decorations. Watch as thousands of fiber optic lights turn from bright reds and yellows into cool blues, greens and purples. Or change the internal disk for vibrant twinkling white lights. Each brilliant tree comes with AC adapter, gold-toned base, 1 white light disk and 1 color disk. UL listed. 5 and 6 foot trees include leg supports for base. Instructions included.